We offer a clear, simple solution which provides a superior, quality introduction to our brand for your puppy and kitten owners. You will no longer be able to order our old Puppy or Kitten Packs. 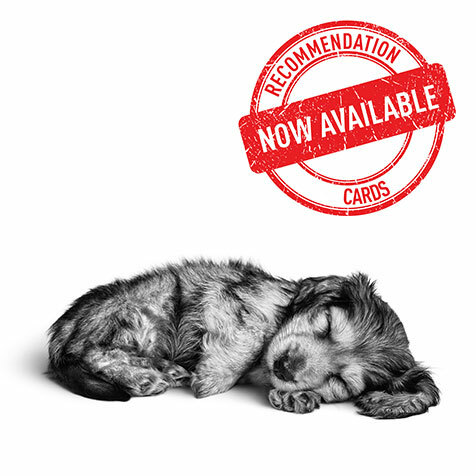 Instead, you can request the new Recommendation Cards to give to your owners when they reserve a puppy or kitten. Please supply or update your email address via the link below so we can contact you with the latest information. 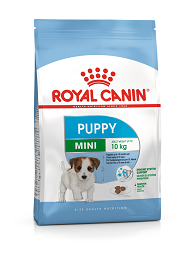 Recommend a ROYAL CANIN® product appropriate to your puppy or kitten’s specific needs. 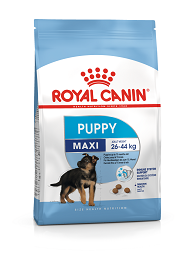 Visit www.royalcanin.co.uk/products/ to demonstrate your recommended product to your new owners. 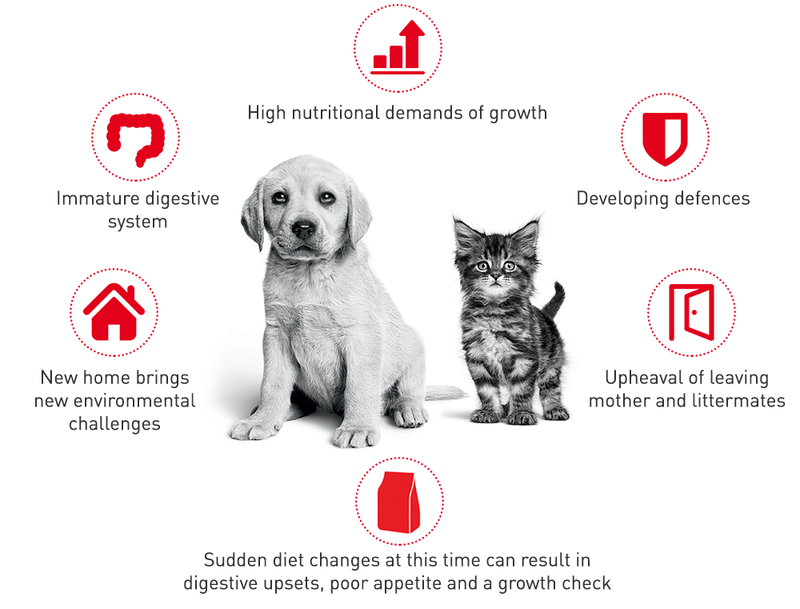 If you have questions about the best nutritional recommendation for your new owners, speak to your ROYAL CANIN® Business Manager. Your recommended product will be sent in both boxes. It is not possible to select a different product for each box, or for us to amend this should the owner change their mind at a later date. Please ensure you continue to make your recommendation clear to the new owner prior to them receiving our call, to avoid any errors in supplied product. Feeding either of these products? 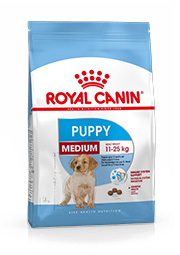 These products are not available in the Welcome Boxes so you will need to recommend the appropriate ROYAL CANIN® Size Health Nutrition Puppy product from our range as shown and feed this in the few weeks before collection. Let your owners know that the more tailored product is your longer term recommendation. They can then use their voucher for this product and we can advise them on how to transition. What will new owners receive? A friendly welcome call from a nutritional advisor to take the owner’s details to arrange the Welcome Boxes and voucher and to answer any additional questions about feeding or settling their pet into its new home. Don’t worry, they can opt out of any further contact during this call if they so wish. Welcome Boxes and voucher, worth over £25/€28. 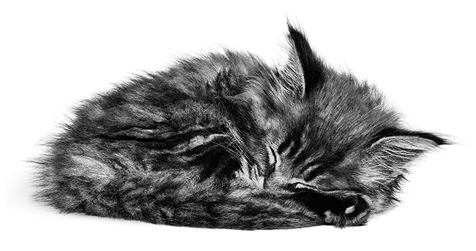 At ROYAL CANIN® everything we do is for the cat and dog. We are founded on the principles of knowledge and respect. 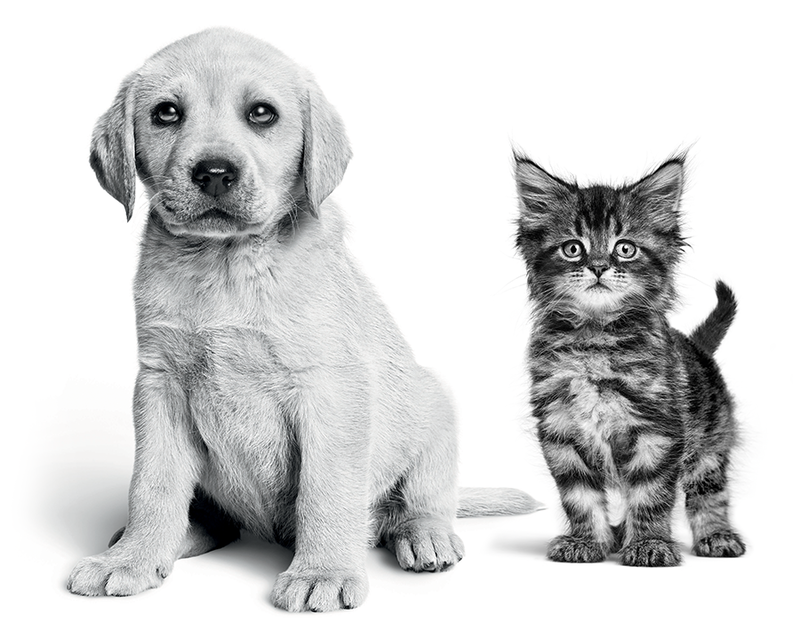 For over 50 years we have worked in partnership with breeders and vets to advance our understanding of the specific nutritional needs of cats and dogs, respecting their true nature and characteristics. For us, each cat and dog is an individual. We consider age, size, lifestyle, sensitivities and breed to develop precise nutritional formulations tailored to different needs, helping to support optimum health and condition in each and every dog and cat. Rather than simply building our foods from a list of ingredients we wish to use, our nutrient-led approach means that we precisely balance over 50 nutrients, each with its specific benefits, and then select the right high-quality raw materials to deliver these nutrients. Feeding a great diet gives results you can see. Our knowledge of feeding preferences and palatability allows us to develop formulas that we know cats and dogs enjoy. After all, even the best diet is useless if it is not eaten! A high level of digestibility helps encourage a healthy digestive performance and good stool quality. We believe that the right nutrition can be transformational, with visible benefits to skin, coat, body condition and ideal growth. Choosing the right diet for your pet represents a long-term investment and our tailored health nutrition formulas go beyond simply meeting basic nutritional requirements. But feeding a quality diet costs less than you think. Quality nutrition means high digestibility and smaller meals – a bag lasts longer and there is less waste too. All this means that feeding costs per day represent great value for money. If your question is not answered here, please contact your Business Manager for further support. 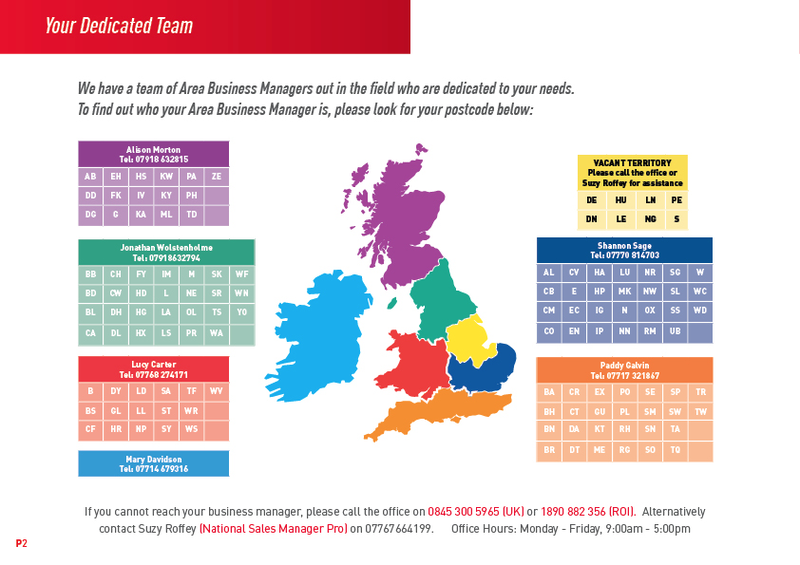 Not sure who is your Business Manager? Why did you change your recommendation process? 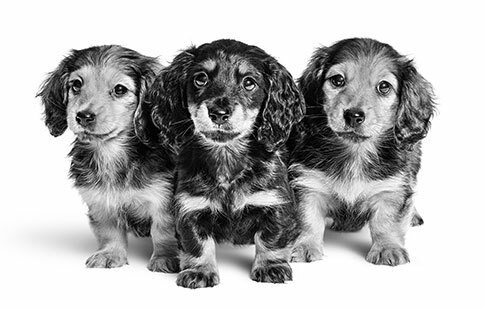 We made the decision to revolutionise our recommendation process to best support your puppy/kitten’s as they move to their new home, to provide a personal, tailored introduction for your new owners to our brand and to offer a simple process which allows you to focus on making a strong, clear recommendation – and be rewarded for doing so. We thoroughly trialled this new process with a 10 month pilot and it has been really well received by owners and breeders alike. We hope you love our process as much as we do! What if an owner has no mobile? In our experience, it is extremely rare for an owner to be unable to send us a text to initiate the 48 hour phone call. In the unlikely event that you have a new owner without a mobile phone, please contact your Business Manager for further advice. What number will show up when you call? Your new owners will see that they are being contacted by a local number. The number will NOT be witheld. What if you cannot reach a new owner? We will try to contact each new owner 4 times and leave a voicemail or send a text each time. On the 4th attempt we will advise in our message that we will not keep trying to call, but that the owner can text us again, including a good time to call in the message, if they do wish us to try again. During our pilot, we have managed to make contact successfully with over 95% of owners who have texted us. Why can't I recommend all your products? 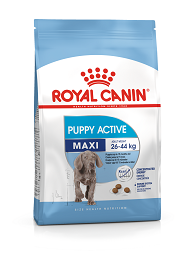 Our Welcome Boxes, sent directly to the new owner’s home, contain a small, trial-sized bag of ROYAL CANIN® diet. 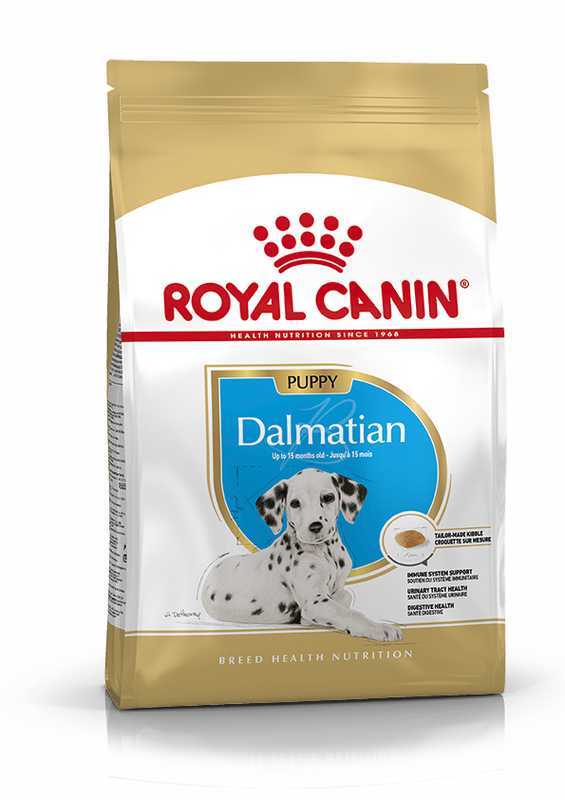 Unfortunately Dalmatian Puppy and Maxi Puppy Active are not available in this bag-size so we are unable to include these in our boxes. However, if you wish to recommended these products as the most tailored options for your puppies, do advise your new owners to use these in the longer term. You can send them to their new homes on the appropriate Size Health Nutrition growth diet so that we can supply this in the boxes. Your new owners can then use their voucher against their first bag, and transition from the product in the Welcome Boxes. What if I sell to an owner who doesn’t visit before collecting their puppy/kitten? We know that, in most cases, you will want to see and speak to new owners so that they can pre-book their new puppy/kitten and be prepared well before collection. However, we also know that there are occasionally situations in which this doesn’t happen. We would encourage you to make your recommendation and give the cards to owners before collection wherever possible. When you are first in contact with an owner by phone or email and you feel that it is very likely that they will buy and collect at the same time, or an owner lives a long distance away and is unable to visit prior to collection, we would suggest that you send the recommendation cards by post, or give the recommendation and text details by phone or email as a back-up option. We can still speak to them before they collect, but if you feel that you are likely to sell puppies/kittens without any opportunity for contact first, we still have our small bags available for you to order and give to those owners as they collect. Do still encourage them to text straight away so that we can contact them within 48 hours and send their Welcome Boxes and voucher straight away. Why do you need to speak to my new owners? We find the personalised contact allows us to support owners better – explaining our brand and products fully, giving individual advice and helping find a retailer for them to continue purchasing. This helps new owners feel more confident in your recommendation and the nutritional messages you have given can be reinforced. Rest assured that this contact will not be a sales or ‘cold-call’ type conversation and it is not intended to replace your relationship with your new owners. As a breeder your support and advice is invaluable to your new owners in the early days, and throughout your puppies/kitten’s lives, and we will be sure to direct your new owners back to you with questions. However, the phone call allows us to start a direct relationship with owners too, so that they feel they can approach us with questions about feeding. Why can’t I hand over the Welcome Boxes to owners myself? Sending the Welcome Boxes direct to the owners gives a high-quality experience for them as they first encounter the brand. The box can be sent at a time when the owner is happy to receive it, before they collect their puppy/kitten, so that they have time to read through the information and redeem their voucher if they wish. Sending the boxes direct also allows us to include the personalised voucher in the box for better impact, and ensures we can send the right product every time, with no issues around stock management or product shelf-life. As we take responsibility for sending the Welcome Boxes to the new owner, you can focus fully on making a strong, clear nutritional recommendation. How can you be confident I will receive my reward points? Our new process will allow us to better track and monitor our reward process. As long as your new owners have your breeder number clearly written on their card, we can allocate your 20 points once we speak to them, although it may take up to two weeks for the points to appear on your account. Once a voucher has been redeemed, we will be able to link this back to you and allocate your additional 30 points. Please do bear in mind however that there can be a delay of several weeks before we receive voucher redemption data from some retailers. I found the new Puppy Pack a great idea because it helped me and the new owners to start getting things in place for the puppy to arrive to it’s new home. The Puppy Packs are sent direct which means that the new owners are organised and have the food that we have been feeding in place for the puppy. As a breeder, we know the benefits of feeding the right food. It is important that our puppies have the best start in life and that is continued in their rapid growth to maturity. The Puppy Pack backs up our recommendation. By getting the pack to the new owner, before they pick the puppy up, they have the information on the food they will be feeding. They are supported in finding a supplier and getting the bags of food ties them into the benefits before they even have the dog. The blanket is useful as we always ask them to bring something we can leave to get the smell of the litter. It also means the puppy is starting to have its own things. The Puppy Pack helps reinforce our rhetoric to ensure the puppy gets the best start. It has been well received by all of the owners from our last litter. We as a breeder are extremely happy with the new Kitten Packs. It gives the new owners something else to look forward to while they are waiting for the kitten, which makes them even more excited to send the text and wait for what they get. The Kitten Pack is really cute and useful with the food and toy etc in it instead of an envelope with vouchers that no-one was using. Some of the new owners are even using the box for the kitten to play in, a much better idea than the previous one and a much more useful pack. 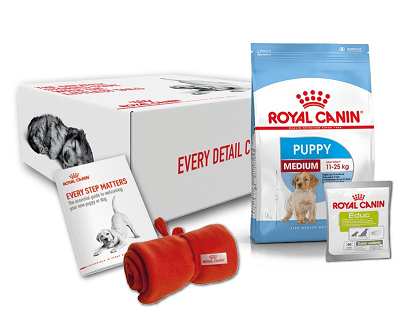 ROYAL CANIN® comes up trumps again, with the introduction of the ‘Puppy Welcome Packs’. It’s an ideal pack for my Chihuahua pups, with the new owners receiving a puppy guide book, Educ treats, puppy booklet, blanket and a 1kg bag of Mini Junior. If that is not all, on registering the puppy with ROYAL CANIN® the new owner then receives a free 2kg bag of food from their nearest pet shop and a further ‘money off voucher’. My new owners loved the packs and the puppies loved them too. I felt they were an improvement on the old packs, especially as the new owners are able to have the food before they get their puppy. 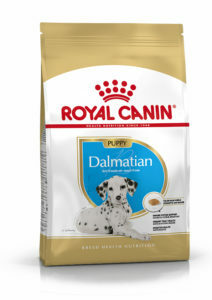 The packs were more attractive to look at and ROYAL CANIN® getting in touch with the new owner is a nice touch. The new Puppy Pack has been very well received by our new puppy owners. 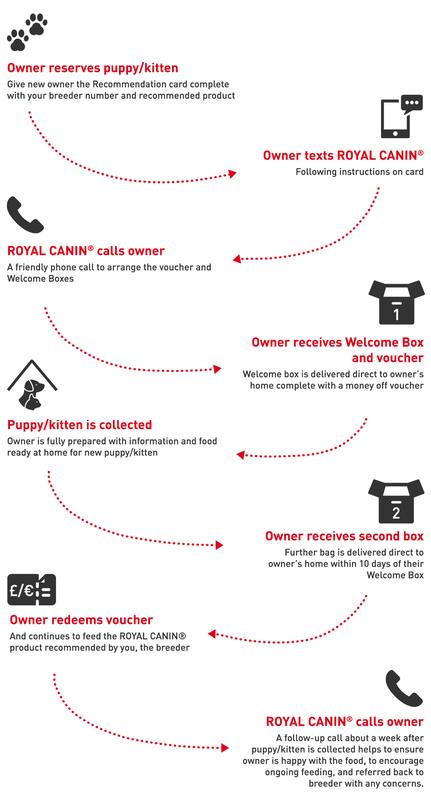 All of the new owners applied for the Welcome Pack by sending a simple text and have been delighted to receive ROYAL CANIN® food, vouchers and a gift. The pack was delivered within a few days. It’s a great support to breeders like us who have used the product for many years and recommend new owners to continue to use the product. We now highlight the Welcome Pack in our new owners manual. Both me and my new puppy owners were delighted with the new Puppy Packs. They enabled the owners to be ready for their new babies and received all the help they needed from ROYAL CANIN® staff. The new kitten packs are fantastic. New kitten owners have been really happy with the taster sample packs of food and the vouchers – and the boxes have been a huge hit with the kittens!